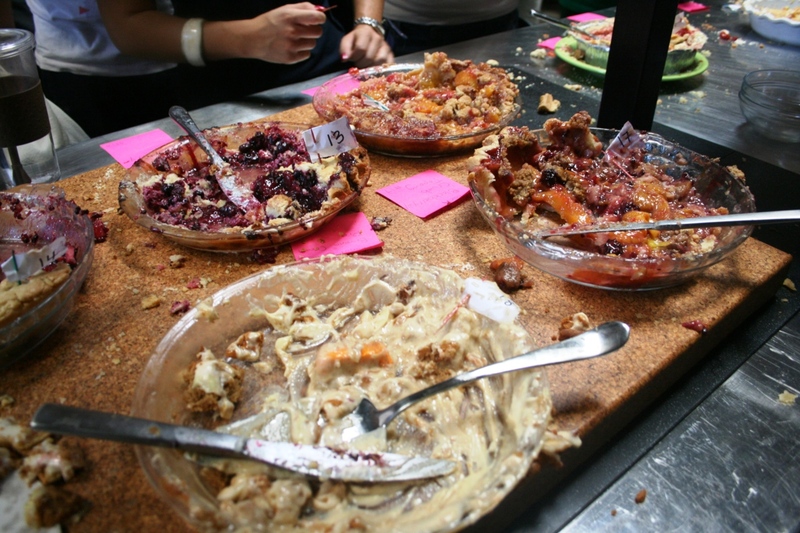 A Cake Bakes in Brooklyn: What Happened at the Pie Contest? 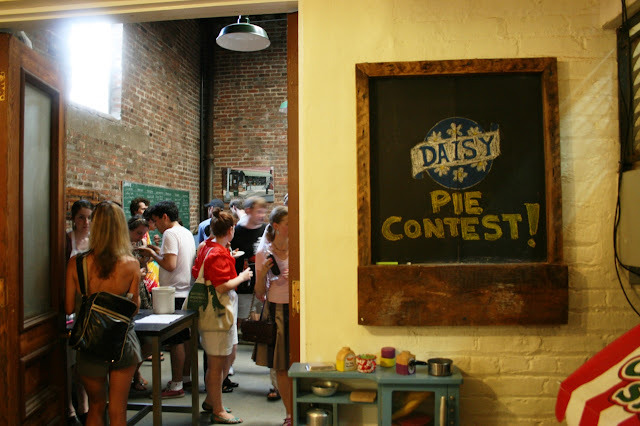 The Daisy Flour Pie Baking Contest, held yesterday at the Brooklyn Kitchen was a fabulous event, and it was truly exciting to just how many accomplished pie bakers are around. There were several super imaginative entries -- a frozen watermelon pie and one called chubby hubby that had pretzels arranged on top. And I don't believe that there were two pies alike. They ranged from coconut cream to blackberry, and beyond. The only rules were that entrants had to use Daisy pastry flour and that the pie be a sweet, not savory, one. Pies on parade. There were about 40 entries. The event was packed and I didn't get to taste -- or even see -- all the pies. It was a bit chaotic, and I'm not sure exactly who got second and third place (one was a fruit pie), but the first prize winner entered a lemon chiffon pie. I was glad to note that the pie baker was a woman "of a certain age." Probably my age, but I think everyone is older than me (especially the older I get -- call it denial). 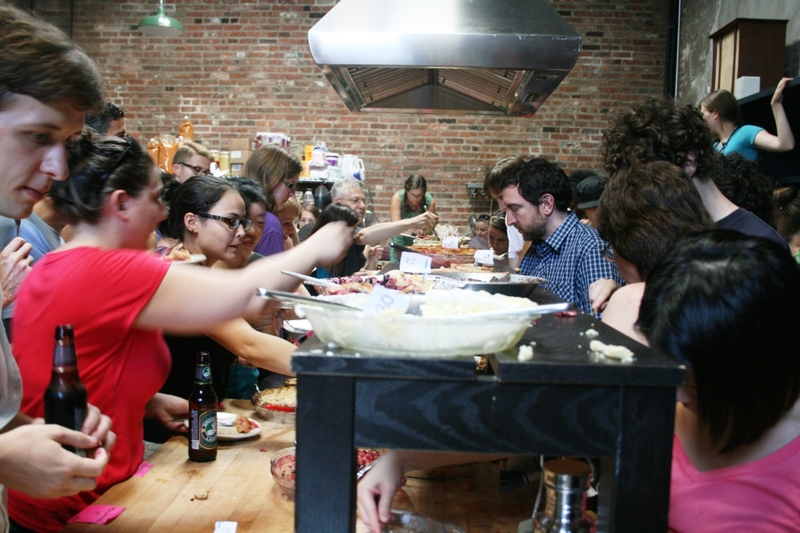 Once the judges got their slices, it was open pie season (read: feeding frenzy). 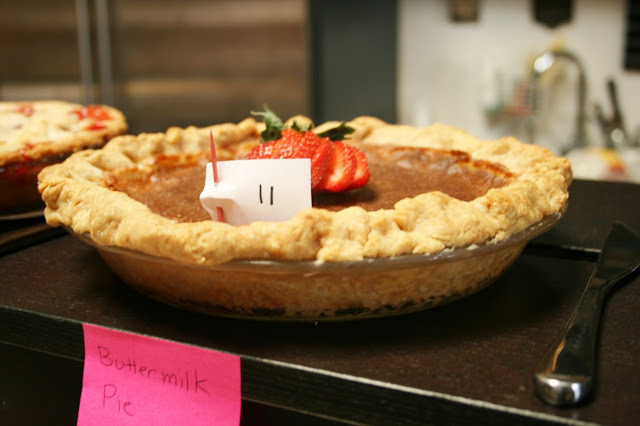 It was disappointing not to win, but once I tasted a piece of my buttermilk pie I knew I wouldn't. The filling, which should have been smooth and creamy, was a bit grainy. Perhaps I overbaked the pie, or maybe it was because I inadvertently bought skim buttermilk instead of full fat and it was too late to get the right stuff by the time I realized it. However, DH, who was roaming the event with his camera (he took all these photos), said that my pie created a lot of buzz -- everyone's talking about it, he reported. Everyone but the judges, I guess! Still, I learned a valuable lesson and you can too: Always, always use pastry flour in the crust. It made a world of difference. The dough was much easier to handle, and it didn't brown too quickly in the oven, eliminating the need for the always annoying aluminum foil collar. My filling wasn't first rate, but my pie crust really rocked. 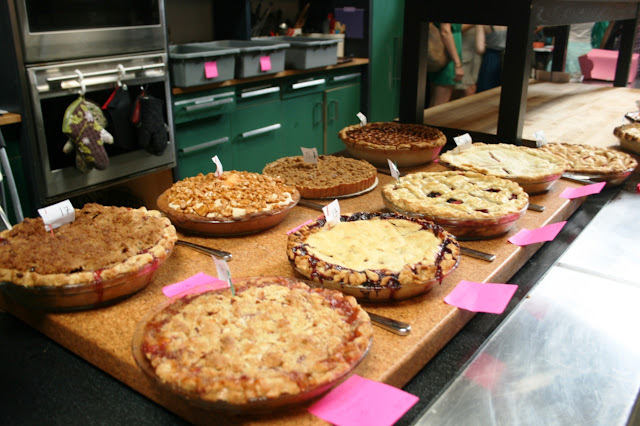 So many pies! My heart leaps at the thought. Sophie -- It was overwhelming. In the best possible way!